The following blog post was first published in 2012. 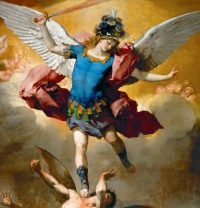 The interest in angels has not waned in the last six years; in fact, fascination with the angelic realm, especially when it comes to demons, has increased over the years. Thus, Christians need to hear what the Bible has to say about God’s holy elect angels more than ever. Contrary to popular belief, angels are neither chubby little babes with rosy cheeks nor are they exquisite young women with gossamer wings decked out in long flowing gowns. The Bible reveals very little about angels. What we do know is that God sends angels to do His bidding. The Bible mentions two elect holy angels (the good guys) by name: Michael and Gabriel. Scripture also mentions the Angel of the Lord; Michael the archangel; the Captain of the Host of the Lord; messengers; and guardians. Also mentioned are fallen angels (the bad guys). Lucifer, one of God’s highest angels, led a revolt against God and was banished from heaven along with his followers which is said to be a third of the angels. There are many names for Lucifer such as Satan, Devil, Prince of Darkness and Beelzebub. The other rebels became demons. In the future God will judge Satan and his demons. Angels are spirit beings and are neither male nor female. In the Bible they appear to people as males, never as females. Because I have written several articles on angels I’m often asked if angels are among us today. Do not neglect to show hospitality to strangers, for thereby some have entertained angels unawares. (Hebrews 13:2). Those who believe they are experiencing an angel visitation must scrutinize what the angel purports. For example, does your angel point you to Jesus Christ or away from Him? Elect holy angels (from here on out referred to as angels) will always point you to Christ, never to anyone else, living or deceased, which includes the Apostles and the Virgin Mary. Angels never espouse new doctrines or extra-biblical (special) revelation. Likewise, they do not point individuals to religions such as Hinduism, Buddhism, Islam, Jainism, Zoroastrianism, et al. Angels by no means encourage participation in the counterfeit religions’ holy days, festivals, ceremonies and rituals, nor do they advance the idea of having a sacred place or space. Sadly, many Christians who have embraced The Silence aka contemplative, or centering, or breath prayer are woefully unaware that what they’re practicing is unbiblical meditation. And then we have “Christian yoga” spreading like a wild fire through the Christian community. I realize that what I’m about to say may not go over well with some readers, however, even if your yoga class is led by a Christian and held in a church, it is taboo! The bottom line is this: Angels would not, could not, promote anything God expressly forbids –and He forbids His children to have any part in pagan religious practices. Moreover, we’re not to embrace the world’s philosophies. I’m also frequently asked if God allows us to contact angels. Do not turn to mediums or necromancers; do not seek them out, and so make yourselves unclean by them: I am the LORD your God (Leviticus 19:31). It is a complete waste of time to “call your angel” or to try to contact angels by constructing an altar…lighting candles…burning incense…meditating… or any other way that allegedly makes angels feel comfortable. God forbids His people from contacting the spirit realm! And besides, regenerate Christians have direct access to God through the Son, Jesus Christ. “For there is one God, and there is one mediator between God and men, the man Christ Jesus.” (1 Timothy 2:5) So, why would we call on angels or anybody else when we can go directly to God through Christ? And I will ask the Father, and he will give you another Helper, to be with you forever, even the Spirit of truth, whom the world cannot receive, because it neither sees him nor knows him. You know him, for he dwells with you and will be in you. (John 14:16-17). Little children, you are from God and have overcome them, for he who is in you is greater than he who is in the world. (1 John 4:4). Again, believers cannot be demon possessed. They are, however, susceptible to demonic oppression. I’ll close with this warning: Contacting angels is neither wise nor safe. Copyright by Marsha West, 2012. All rights reserved.